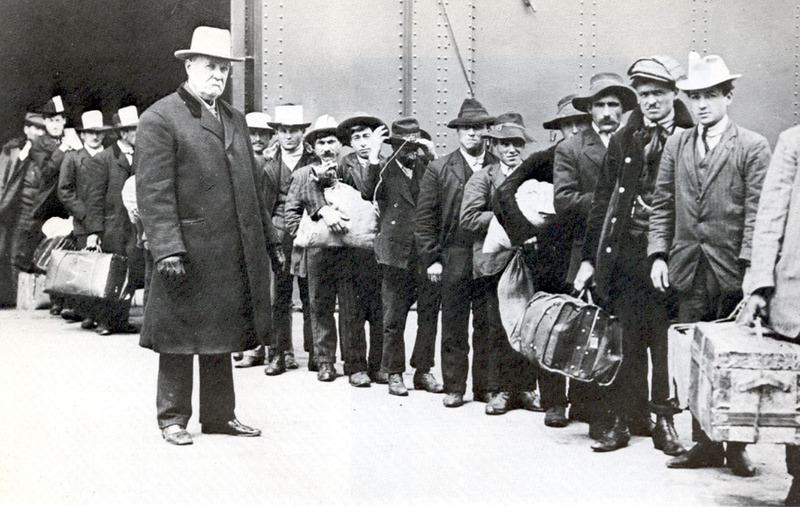 During the mass emigration from Italy during the century between 1876 to 1976, the U.S. was the largest single recipient of Italian immigrants in the world. However, their impact was not as great as countries like Argentina and Brazil. That was due to the fact that hundreds of thousands of immigrants from nations all over the world were migrating to the U.S. at the same time and American born natives already made up the majority ethnic group. The Italians did play a major role though, socially with individuals rising to national stature in many different fields. In 1850, less than 4,000 Italians were reportedly in the U.S. However in 1880, merely four years after the influx of Italian immigrants migrated, the population skyrocketed to 44,000, and by 1900, 484,027. From 1880 to 1900, southern Italian immigrants became the predominant Italian immigrant and stayed that way throughout the mass migration. Despite the increase numbers, the Italians were not the largest foreign-origin group in American cities. Outnumbered by groups migrating for decades before them. Italians only made-up 1.5% of the U.S. population at its peak. In the U.S. where the abundance of cheap land could no longer be found, the mostly agricultural Italians in Italy, became mostly urban. Starting from the bottom of the occupational ladder working up, they worked jobs such as shoe shinning, ragpicking, sewer cleaning, and whatever hard, dirty, dangerous jobs others didn't want. Even children worked at an early age, as in Italy, even at the expense of their educations. The Italians were known for rarely accepting charity or resorting to prostitution for money, another reflection of patterns in Italy. As in many other places in the world, Italians in America clustered into groups related to their place of origin. For example, the Neapolitans and Sicilians settled in different parts of New York, and even people from different parts of Sicily settled on different streets. However, what seldom occurred in U.S. were Italians enclaves, or all-Italians neighborhoods. The Italians would disperse themselves in other immigrant groups, such as, the Irish, the Jews, the Germans, and the Poles, while remaining in their clusters. Also, immigrants usually settled in different regions of U.S. based in where they came from in Italy. The Sicilians resided in New Orleans, the Neapolitans and Calabrians in Minnesota, and mostly northern Italians in California. However most of the Italians were concentrated in the mid Atlantic states in 1910 with 472,000 in New York and nearly 200,000 in Pennsylvania at the time. The living conditions for the Italians tended to be over crowded and filthy all over the U.S.. Italian laborers also tended to skimp on food in a desperate attempt to save money. However, after time and new generations of Italians, the dirtiness of their homes disappeared along with the complaint of weak Italians from lack of nutrition. The Italians were noted for their diligence and sobriety as workmen. In the late 19th and 20th centuries, Italians often became fishermen, shoemakers, waiters, fruit sellers, and tradesmen. Most were unskilled laborers though, working in mines and construction jobs. Over the years, the Italians rose up the economic scale but acquiring job skills in blue-collar job rather than by becoming educated and entering that profession.